The history of unions in Minnesota dates back to 1861 when almost 100 educators in Rochester formed the Minnesota State Teachers Association, with a name change to Minnesota Education Association (MEA) in 1876. In 1918, the Minnesota Federation of Teachers (MFT), which began as the Grade Teachers Organization in 1898, formed. On the national level, MEA affiliated itself with the National Education Association (NEA) and MFT affiliated itself with the American Federation of Teachers (AFT). In 1998, MEA and MFT merged to create Education Minnesota. This merger was the first of its kind in the country and is why members hold memberships with and pay dues to NEA, AFT, Education Minnesota, and its local affiliate. The majority of teachers in the classroom today have never voted in an election for exclusive representation by a union. Teachers who belong to the union are eligible to vote on the contract negotiated by the union with their employer, and they also get to vote on local union representation, but they never get to vote on whether the union has represented them well. Education Minnesota states a commitment to “democracy in the workplace,” yet it never has to stand for a certification/retention election under Minnesota law. Read our full report on the history of Minnesota’s teachers’ unions here. Full union membership dues cost teachers between $800-$1,000 a year. These dues are divided up between the local union, Education Minnesota, and the National Education Association and the American Federation of Teachers. The dues are the same for all teachers even though younger teachers make much less and often have student debt and other start-up expenses. Union dues are the union’s main source of revenue and are used for collective bargaining but also for advancing the union’s political agenda. Each year, the union collects PAC ($25) and Foundation for Excellence ($5) money from teacher members. 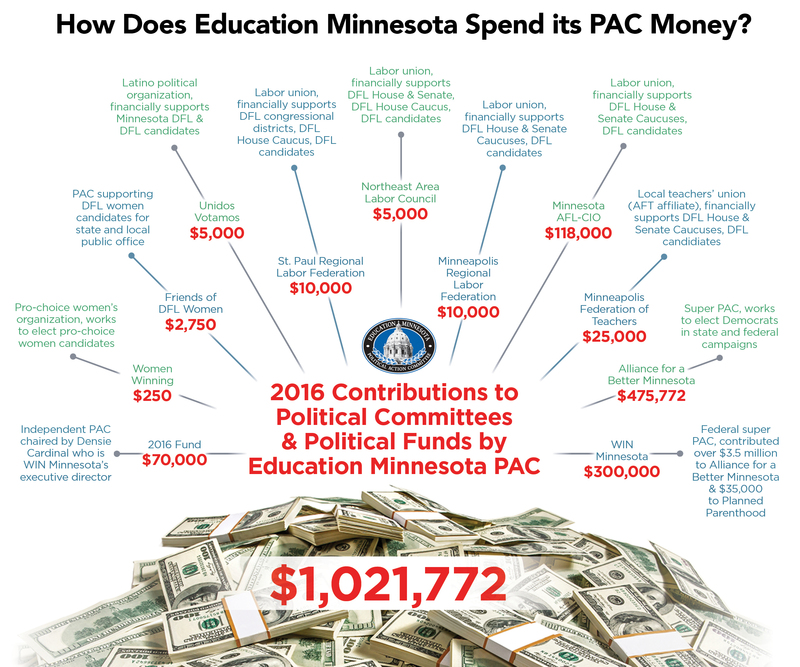 In 2016, the PAC took in roughly $1.8 million for explicit political spending and approximately $1.4 million in 2017. You have reached the Education Minnesota refund request hotline. The refund request forms for the political action committee and the Foundation for Excellence in Teaching and Learning appear in the October issue of The Minnesota Educator. This issue should be mailed to your home between the last week of September and the first week of October. To qualify for the refund, you must be an active member of Education Minnesota. Fair share and retired members do not qualify as their dues are not assessed. Only one set of forms may be requested per individual. You may not request multiple forms to be sent to you or request forms for others. Photocopies will not be accepted. These forms will not be available to Education Minnesota to mail out to you until the first week of October in the current school year. If you are calling to request copies please leave your name, including spelling, complete address, and the forms you wish to have sent. These forms will be mailed the first week of October. This date also applies to new members starting at the beginning of the school year. The forms must be mailed back to Education Minnesota postmarked by October 31st. You can expect your refund check to be mailed by November 30th. If you join Education Minnesota mid-year, you have 30 days from the day you signed your membership to request the forms. Please state the date you signed your membership application on this message. Once you have received your refund forms, please submit within 30 days. Thank you. The Janus decision means there are no longer “fair-share” payers, only full union members. Employers are no longer deducting those fees (about 85 percent of full dues) from paychecks. Prior to Janus, the union’s reported “chargeable” activities in a “Hudson” notice, used to calculate fees, were only supposed to include expenses associated with collective bargaining. Education Minnesota, however, routinely included “chargeable activities” that were clearly political or had nothing to do with collective bargaining. Short of a legal challenge by a teacher, there is no oversight of the accounting claims made by Education Minnesota. Read our full report on Education Minnesota, union membership, and the First Amendment here.